This project started out with the goal of making a nice looking Anderson PowerPole break-out box. Break-out boxes let you take advantage of one large power supply at a nominal voltage (e.g. 12V) and power all your gadgets and radios. Normally, these sorts of things start at $20.00 and the price escalates quickly with additional connectors. We wanted to make an inexpensive break-out that wasn’t a nightmare to put together, using a 3D printer to make the case. 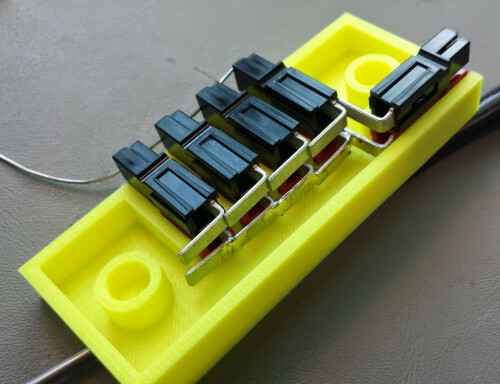 Mike Glover, AE5ZC, along with Matt Barlow, W5VO, worked together to create a parametrically adjustable object suitable for 3D printing, and present assembly instructions for you to build your own. IMPORTANT NOTE: As one astute reader has pointed out, the pictures below show the PowerPoles assembled incorrectly. We were in such a hurry to capture images that we didn’t notice this, but fixed it later so that we were in ARES/RACES standard orientation. With the contact “tongue” on the bottom and looking at the contact end, the RED contact should be on the LEFT. For a graphic that shows the proper orientation, see: http://www.powerwerx.com/assembly.asp. 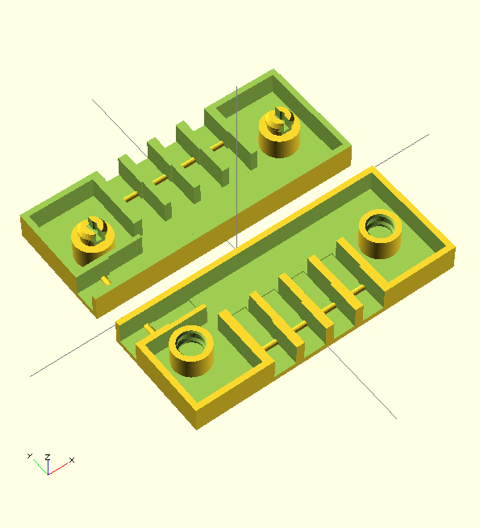 OpenSCAD rendering of the PowerPole Case (Revision F). OpenSCAD is a programming language and compiler system for working with 3D shapes. As the language supports variables, conditional statements, and loops; it is relatively easy to make an object that can be easily customized based on various parameters. Coupled with the ability to import existing libraries from repositories such as Thingiverse, complex objects can be created. With a completed OpenSCAD program, you can then compile the object into a 3D printer-friendly .STL file for slicing and printing. 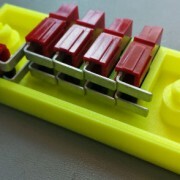 Using a library containing various plastic snaps by Tony Buser, as well as a library with a model of PowerPole connectors from Jerry Dunmire, we were able to make a model that closely conforms to the shape of a PowerPole connector and snaps together, requiring no additional fasteners. 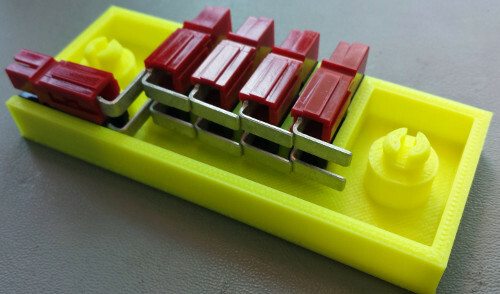 Taking advantage of the ability to program loops, the number of connectors in the case can be expanded by simply changing one variable. After further tuning of the program, we may make it available on Thingiverse for others to enjoy. First attempts at making a break-out used normal crimp contacts for the PowerPoles. Snap connection points were added to eliminate the need for nuts and bolts. 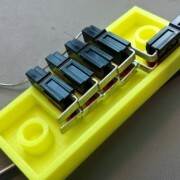 However, a lot of crimping and soldering and precise wire cutting is required to make it work electrically. This doesn’t scale quite as well as a parameter in OpenSCAD, so another solution was found. 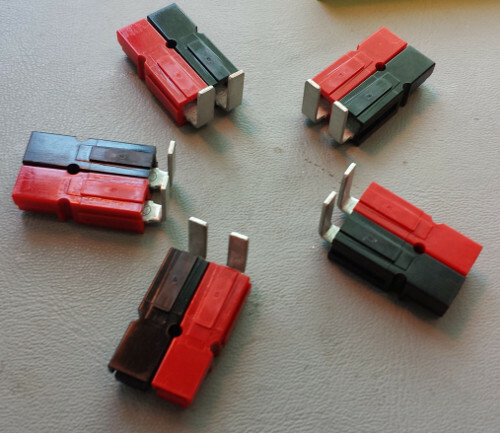 In addition to the normal wire connectors, Anderson makes a set of PCB-mount connectors rated at various currents. The 45A-rated contacts are pretty interesting because they are wide and can be used to create the type of break-outs that are commonly seen for sale using one simple PCB. Taking the minimalism a step further by abusing the right-angle 45A contacts, the need for a separate PCB can be eliminated. 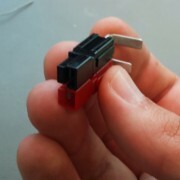 The tip of the right-angle connector can be soldered directly to the right-angle bend of the next one. While that type of solder joint probably doesn’t qualify the system for 45A, it is probably sufficient for most HAM purposes. Additional 10 AWG wire could be soldered on to the contacts to improve the robustness of the setup. The effort to assemble the design now scales very nicely, and results in the bare minimum number of parts to build a PowerPole breakout. The table below lists all the parts you need for making your own breakout. Unless you’re making a lot of these, or ordering the housings in bulk, you probably won’t be able to make use of any volume discounts. For each connector, you’ll end up spending $1.36. The five connector version shown in this post would cost $6.80 in parts, and roughly 30g (or about $1.35) of ABS filament. All the pieces required to make a quick and easy PowerPole break-out. Includes two mating halves of the plastic case, black and red housings, and the 45A right-angle PCB contacts. Some 10-12 AWG wire is optional to improve the current handling of the breakout. Assemble all the red and black hood pairs together. If you have an existing orientation that you’re trying to match, make sure that everything fits together (with the right colors) now, before it’s too late. Building the splitter takes a bit of care as there definitely is an order of operations. Failure to follow these directions can lead to parts not fitting together correctly. You must slide the hoods together all the way before you can start soldering, and you really need to use the case as a construction jig. The PCB contact is pressed into the PowerPole shell. Snap the right-angle connectors into the hoods. They take a bit of force to snap in, but it should only fit in the correct orientation. 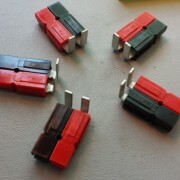 Five connectors with the 45A right-angle PCB contact for the powerpole breakout. 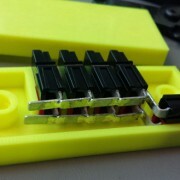 Place the assembled connectors into one side of the plastic shell. The shell will be used as an assembly jig to hold all the hoods and pins in the correct position. There will be some play with the connectors even after they are assembled, so using the case as a jig is highly recommended. Make sure all hoods are oriented correctly and lay flush on the bottom of the case. All connectors have been firmly seated in the first half of the case. The red contacts will be soldered together first. Solder the top set of pins together. Move quickly to avoid melting of the plastic hoods, but also make sure that the solder has properly wetted both surfaces. The bend of the contact takes longer to heat up than the end of the contact. 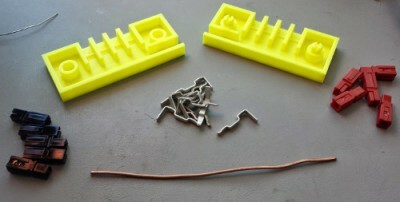 The connectors have been removed from the first shell and inserted into the other shell for soldering the opposite row of contacts. Carefully remove the connector assembly from the case, and insert it into the other half. Once the connectors are seated in the other half of the housing, solder the other half of the connectors. Again, take care to avoid cold solder joints. Fully soldered module ready to snap close with the lid. With the connectors completely soldered, it is now time to snap the two halves of the case together. Carefully apply force on the case while ensuring that the connectors are aligned on both sides. Once finished, the two halves of the case should be flush, with little to no gap. 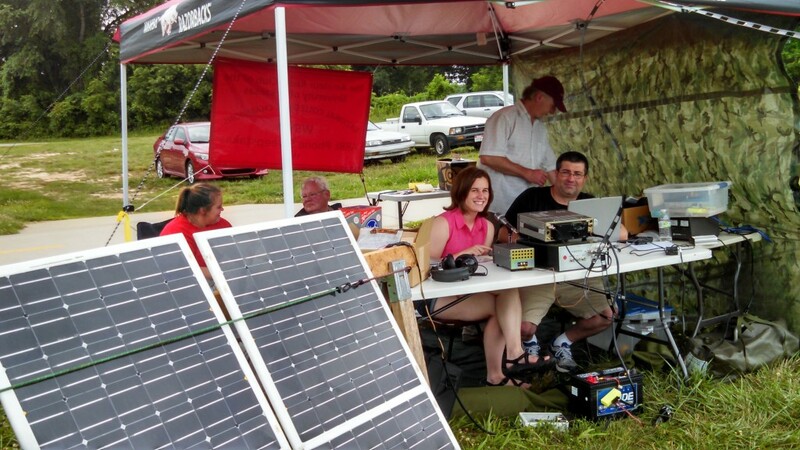 Preliminary testing of the setup on Field day was successful, with no failures or issues connecting an HF radio, solar charge controller, and a lead-acid battery. Do note that it is strongly recommended that you put an appropriately sized fuse between the breakout box and the power source. 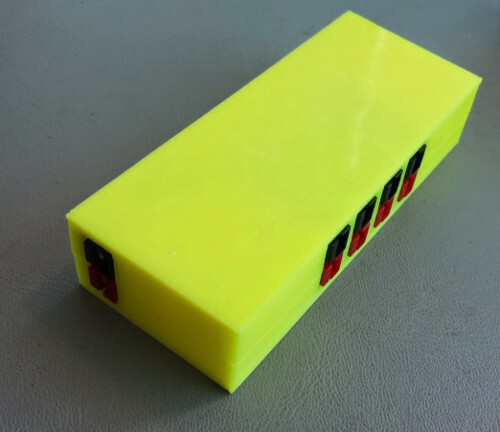 Some small work remains in cleaning up the OpenSCAD script, and then it will be made publicly available so that you, too, can 3D print your own PowerPole break-out box. 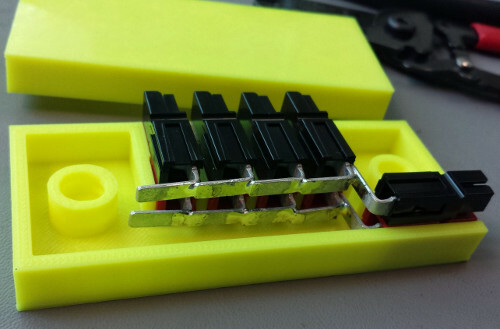 UPDATE, 10-Aug-2014: The OpenSCAD script and an example STL file for a 4-position breakout box (1 connection on the side and 4 on top) has been uploaded to Thingiverse HERE. A view of the ARCUA Field Day 2014 site in which the solar panels and battery are visible. At the operating table are Hannah, KD5WNF and Mike, AE5ZC. Standing just behind the table is ARCUA faculty advisor Larry, WJ5V. Behind the panels are ARCUA student president Jill, AC0MX and Robert, KC0GHY. In front of the operating table you’ll see the battery; the yellow box in front of the battery is a parametric PowerPole Breakout box in use!